If you look closely, there is a hawk perched on the post that has a few nesting boxes on it. Is the hawk hoping a bird will return and make an easy lunch for him, or is he sizing up the nesting boxes and working out a discrimination law suit? There is no Hawk box here, only blue bird and owl boxes. 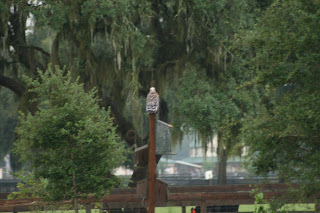 The hawk has been observed selecting one Purple Martin from a nearby Martin House. I know killing and eating go on, I just wish he would do that somewhere else!